This letter (below) was written by Tran Huynh Duy Thuc’s daughter in light of a possible attempted poisoning against him in prison on November 20 and overall worsened prison conditions. Thuc is one of Vietnam’s most well-known political prisoners and one of the leaders of the democratic movement. The founder of an Internet service provider company, he was arrested in 2009 and prosecuted under Article 79 of the 1999 Criminal Code for his social, political, and economic writings. He was later sentenced to 16 years in prison. He refuses to be exiled in exchange for freedom, vowing instead to appeal his sentence by using new provisions in Vietnam’s revised 2015 Criminal Code. Please share the letter and urge Vietnam to improve Thuc’s immediate conditions and to release him from prison. 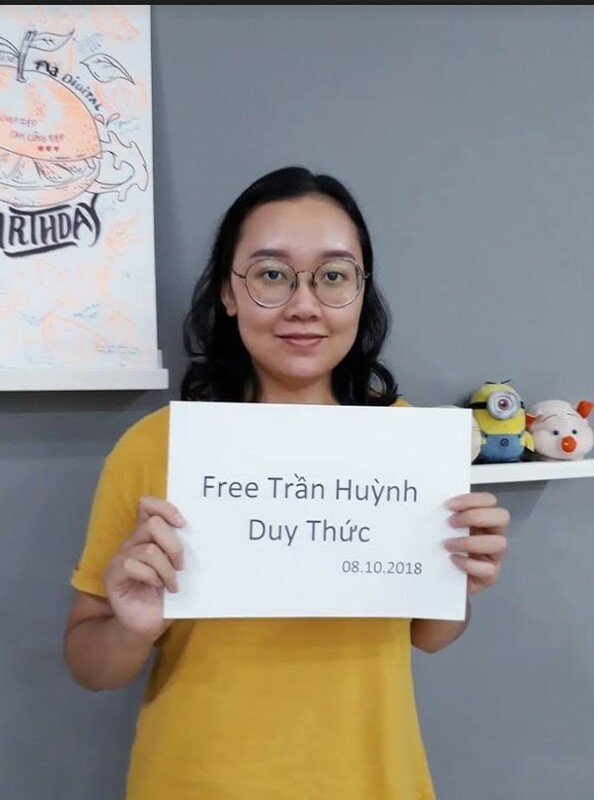 My name is Tran Le Bao Tram, daughter of the Vietnamese prisoner of conscience, Tran Huynh Duy Thuc. My dad was arrested in 2009 and falsely convicted based on Article 79 of Vietnam’s Penal Code “attempting to overthrow the People’s administration”. He was sentenced to 16 years in prison and since then has been serving for more than 9 years. Two years ago my dad was transferred to Prison No. 6 in Nghe An province, which is around 3000km away from his family. Since then he has faced many threats and mistreatments, and the long distance is a major obstacle that stop our family from helping him. Due to recent grave events, I’m writing to call for your help to preserve his health and safety. On Saturday Nov 24, 2018, my aunt and uncle came to visit my dad on the monthly visit and learnt that my dad is increasing facing threats from the prison officers. On Tuesday Nov 20, 2018, my dad woke up like usual at 5.15am feeling extremely dizzy with high blood pressure at 150/110 (measured using his personal blood pressure monitor) and covered in sweat. When he drank some water, he immediately vomited and found a bit of blood mixed in the vomit. While resting, my dad vomited again and that time some bile was mixed in the content. The prison medic came to check up on him and gave him 2 pills for “cerebral blood deficiency”, which he took and vomited out again. Our family is extremely worried about his health and safety since we believe these new forms of mistreatment are used to coerce my dad to admit guilty in exchange for an early parole. For the past 9 years, my dad steadfastly believes that fighting for freedom of speech is not a crime. My dad has never inflicted violence or threats against the government. He has announced for many times that he is innocent and will never admit guilty. Hot boiled water, reading light and health monitors are crucial to preserve his health in the prison. Hot boiled water is more sanitized and can be used to cook instant food, while reading light prevents eye diseases caused by the poor lighting condition in the prison cell. My dad also has high blood pressure and high blood sugar diseases so the personal monitors help him check his health when needed.